The thick red carpet... installed to heighten the sense of luxury. To take the mind away from... The long hallways. The doors that never end. That all look the same. Work that never ends. It never pays. And it always repeats itself. Around the next bend... maybe there is something different. Something new. Or at least to be done. To reach the elevator. Use WASD or arrows to navigate and mouse to interact. Escape ends everything without any mercy. Use one of the top two graphics settings or the game becomes really horrendous! Warning: contains a lot of glitches and effects so if you are sensitive, consider yourself warned. If you run out of levels and want to add your own... or just, I don't know... have a look. 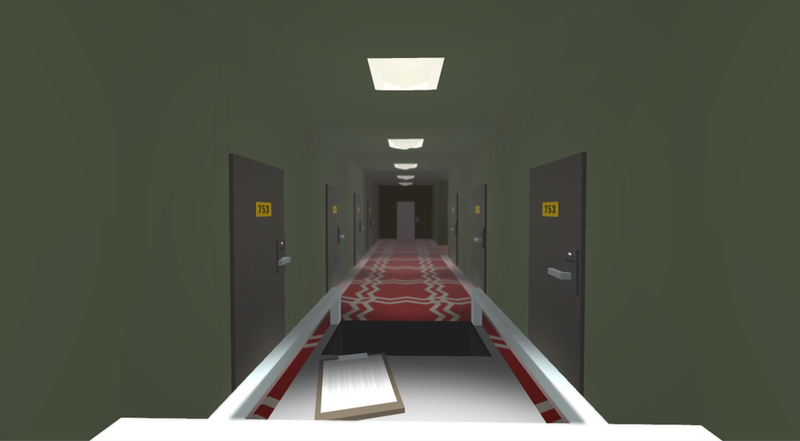 The Stanley Parable meets The Shining. Pretty neat stuff, some fun visual effects. I actually had a copyright claim against my play through of this because of the music. I won the claim, but I thought it was interesting. Cheers! So this was definitely an interesting game. Some of the puzzles took me forever to figure out (especially the last one, which I was totally overthinking). If you continue work on this game after the Dare, I'd suggest a couple of things. 1: If you really want this to be horror, one of the best things you could do is have the music change as the player progresses. The happy-go-lucky elevator-esque music doesn't really work well for raising tension. 2: Change up the rooms just slightly, especially at the beginning, or make the rooms part of the puzzle. Fun game, I'm looking forward to more of your work! Thank you so much for playing and recording your play. It is of great value to get to see how they interact with the game. We are hoping to do both of the things you are suggesting and more. The todo-list has already expanded to be almost longer than it was when we started making the game. As well as the thing you didn't put in the comment but was very clear from the video: the player deserves a better wrapping up of the experience in the end. Awesome, thank you so much for playing and recording it! We made this game during 72h of Ludum Dare so we had to cut some corners to make the deadline. We are planning to do a more worked-through version fixing the graphics issues you were having, making it more clear that work never pays (or possibly making work worth more) and adding proper story-ending(s). Also more secrets, more disturbing things. We'll definately take into account the things we've learnt from watching your Let's Play and we take it as we'll need to up the creapyness of the game. Players often say that our games freak them out/are scary. We totally agree that it's is no classical horror, but maybe more of an existential dread kind of nightmare. Over the course of the 72 hours that we made it, it turned out more of a puzzle than we thought we were making. 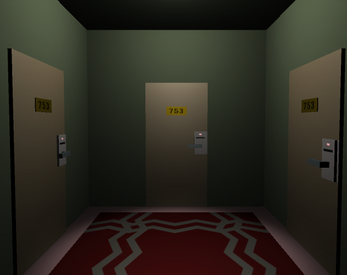 But, am I guessing right that you are quite versed in horror games and need a stronger fix? I guess we would like to strike some good balance between nightmare and puzzle. If you have any further input, we are all ears. I always need a stronger fix - personally, haha. 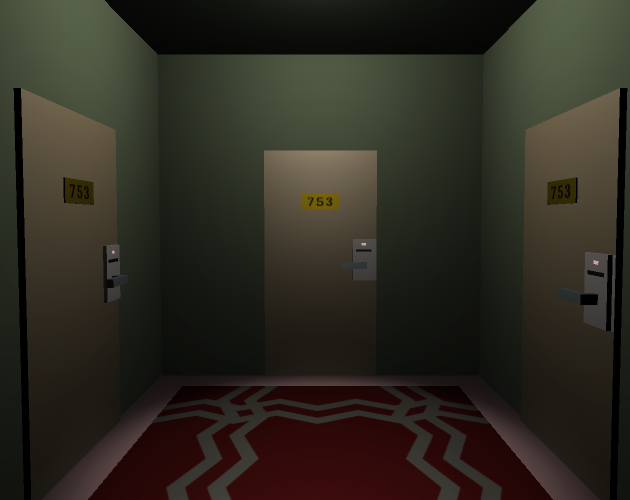 The game has the potential of just making people paranoid of 'what if' something is behind me, since its first person and has slow rotation, it leaves you susceptible to potential 'attacks' to the mind - whether that be subtle jumpscares or things, ghosts, sorta like a The Shining, 2 girls down the hallway eeriness - type of horror. That's at least what I get the vibes of. Oh god I feel like I'm in some sort of time warp or a Franz Kafka story. REally cool game. I want to keep playing it to see if it ever ends.